Mandeville Canyon is located in southern California on the west side of Los Angeles. The property, not quite a full acre, has characteristics of a typical canyon profile: rocky, steep slopes, and sandy, flat floors. It was this unique setting that guided and informed the landscape architect’s design decisions; from the treatment of the slopes and flatter areas, to the siting of the house and major landscape elements. Barker Evans Landscape Architecture engaged in a collaborative design effort with the architect and client from the beginning of the project, resulting in a decision to position the home at the southern end of the property at the lowest spot. Although this placement may seem counter-intuitive, the result was a home with commanding views of the canyon walls and space to transition from the built landscape to the natural landscape beyond. To minimize the use of retaining walls and the need for extensive grading, the property was divided into three zones from west to east. Zone One, the west side of the property, integrates a series of low garden walls to create three terraced spaces. 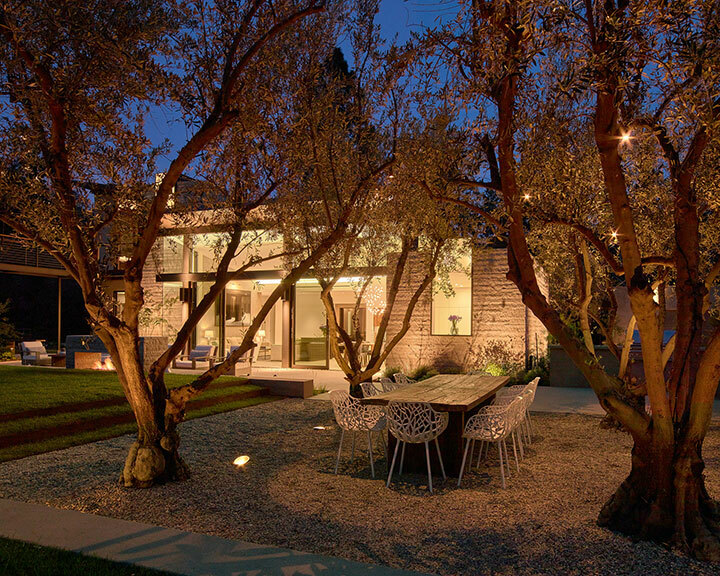 The lowest terrace accommodates the house, a seating patio with fire element, and a gravel dining terrace. The middle terrace contains a pool, spa, and play lawn. The upper terrace is reserved as a native California Sycamore grove. 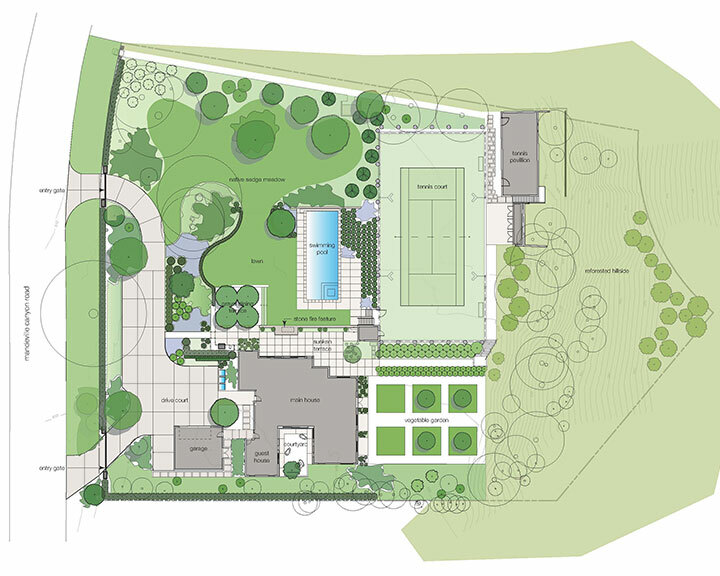 Zone Two accommodates a plateaued tennis court and large vegetable garden. Zone Three, the eastern portion of the property, is a protected hillside revegetated with Coast Live Oak trees. Although the drought in California had not yet come to a crisis point when the design process began in the summer of 2013, the design team was consistently mindful of water usage and sustainable practices. 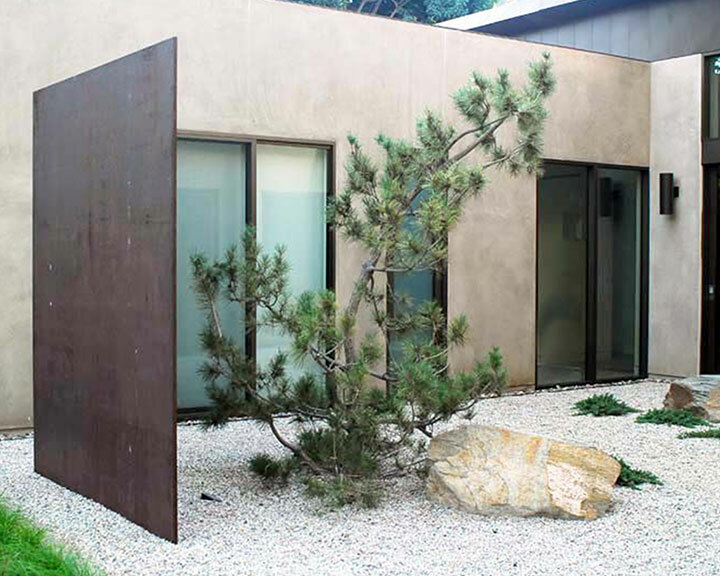 The landscape architect found opportunities to increase permeable surfaces by integrating gravel and decomposed granite wherever practically possible. As well, the vegetable garden is watered with the household’s grey water system. 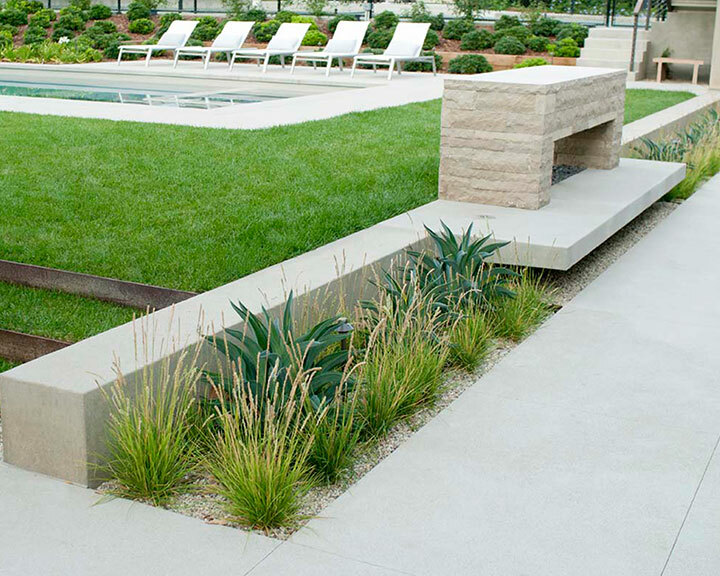 The plant palette throughout the site integrates both native and drought tolerant plant species. Large swaths of the property were revegetated with native trees; 24 California Sycamores and 36 Coast Live Oaks now populate the property. These trees, once found abundantly along the canyon floor and walls, provide habitat to local birds and other native fauna.